The concept of a mid-engined sports car was regarded, in the 1960's, as the special preserve of only racing cars and exotic road cars. Consequently, when Lotus, known primarily as a producer of racing cars , introduced the Europa in 1966, it became the first car manufacturer to offer a mid-engined sports car at a price that many people could afford. In fact, the engine was positioned, for optimal balance and handling, between the passenger compartment and the rear wheels. By the mid 1960's, the racing cars produced by Lotus had gained world wide prominence. One of the reasons for this was that a mid-engined Lotus had swept aside competition to win the 1965 Indianapolis 500 race, with the result that other racing car producers switched from traditional front engine layout to a mid-engine format. Although Colin Chapman had considered the idea of a mid-engined road car, until the mid 1960's, there were no suitable engines and drivetrains, available in quantity, that were also realistically priced. To complicate matters, his existing production facilities were fully stretched building the successful Lotus Elan, in all its variants. However, in 1965, the picture changed, when Renault launched the Renault 19 saloon, its first front wheel drive car. After considering his options, he decided to acquire additional production facilities near Norwich, on the site of a WW2 US Air Force Base. The plan was for a mid-engined sports car, powered by a modified Renault 16 engine and drivetrain, which would be designed and built by Lotus. He was keen to build a foothold for his road cars in Europe, and take advantage of the recently created European Common Market. To this end, his agreement with Renault stated that, for the first few years, he would focus his marketing efforts for the new car solely on the Continent. He initially wanted to name his car the "Europe" but, owing to legal constraints, was forced to change it to Europa. Furthermore, an additional benefit resulting from this agreement was that Lotus would no longer be heavily reliant upon Ford for its engines. The car would have bolt on wheels, and the braking system would consist of discs at the front and drums at the rear. An important feature of the mid-engine layout was that it would greatly reduce body roll, offer a higher level of grip, and generate the handling characteristics associated with Lotus cars. Like previous Lotus road cars, the new model would be offered as either a factory built unit, or in the form of a self assembly kit. Unfortunately, as it would turn out, the build quality of the Europa would be on a par with previous models, in that it would be average, at best. 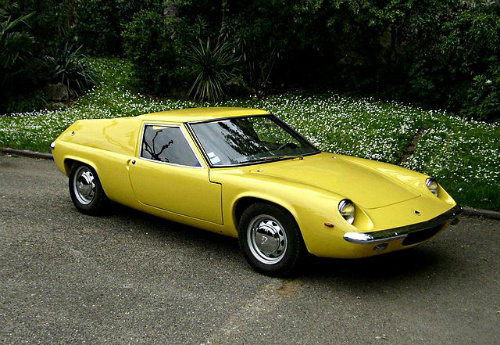 The Series 1 Lotus Europa sports car, also known as the Type 46, was a two door, mid-engined, fixed head coupe, that was launched in December 1966. The original Europa was designed as a club sports racer, to act as a replacement for the Lotus Seven. Like the Elan, it had a fibreglass moulded body fitted to a steel backbone chasssis, which would keep the weight down to a minimum. It had independent coil spring suspension all round, with a form of MacPherson strut on the rear. With the exception of the doors, bonnet, and boot, the fibreglass body was created as a single unit. It had a drag coefficient of 0.29, and superb handling. It was fitted with a lightweight aluminium alloy, modified Renault 16, 1470 cc, inline 4-cylinder, overhead valve engine, developing 82 bhp, compared with the 52 bhp from the standard unit. It had a maximum speed of 121 mph, with a 0-60 mph time of 9.3 secs. Only 296 units of the Series 1 Type 46 were ever built. To keep production costs low, the car was of a basic construction, with side windows that would not move, fixed seats, a lack of handles on the door, no internal door covers, and an aluminium dashboard. However, the later Series 1A and 1B had removable side windows, a wooden dashboard, and internal door panels that were able to accommodate the windows, when removed. Rear vision consisted of a narrow slot behind the driver's head, which only gave a view directly to the rear. In total, 348 units of the Series 1A and 1B were built, which meant that 644 Europa Series 1's were finally built. Europas were very fragile, with the lightweight body subject to easy destruction. The steel chassis central beam was resin bonded to the fibreglass body, which helped reinforce stiffness, but making repair unduly complicated. Furthermore, the steel backbone was prone to rust. A 1967-68 Lotus Europa Series 1 in good condition would fetch in the region of £12,000/$19,000 to £15,000/$24,000.